Hair transplant is a surgical procedure. All surgical procedures have risks. It is important that you do your research thoroughly before making a decision about hair transplantation. Spend at least 6 months researching and talk to as many doctors and patients as possible. Also, be realistic with your expectations. While hair transplant can be a very effective treatment for hair loss, it will by no means give you your teenage density back. In addition, there is no one doctor that is the best for everyone. Every doctor has something different to offer. Hair transplant is not an exact science. Even the absolute best doctors in the world have their share of unhappy patients for whatever reason. 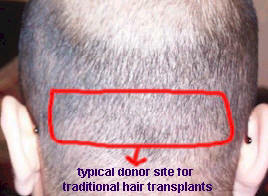 Go through the hair transplant information on this site as a start. If you want, email me at hairsite@aol.com, I can get different doctors review your case and let you know if you are a good candidate for the procedure or not. Hair restoration news, stem cell hair growth research and cutting edge hair transplant techniques from around the world. Everything about hair loss. Excellent illustration showing how the so called FUE white dots are invisible even with a #1 guard shave. Topical post-operative formula formulated by Dr. Cole to promote hair transplant healing and anagen hair growth. Juvista (phase II trial now) - UK Renova website. If you are associated with a particular hair transplant clinic, eg: employees, consultants, webmasters or anyone who is compensated directly or indirectly by a particular hair transplant clinic, please clearly state so in the signature portion of your post.